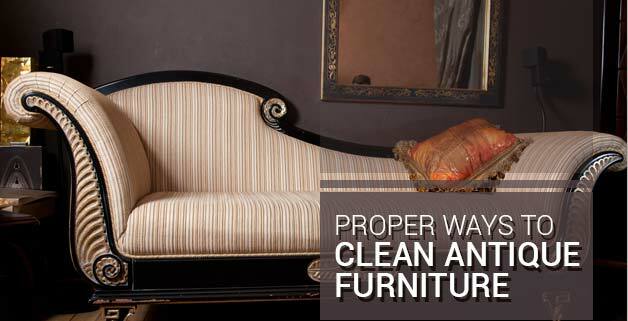 Antique furniture is beautiful, but how do you keep it clean without permanently damaging it? There are a number of different ways that involve spending a lot of money and hiring a professional to do the job, but when you’re on a budget, the easiest options aren’t always the best. Here’s how you can clean your antique furniture on your own without damaging any of the lovely pieces in your home. First of all, you need to remove any and all wax from the furniture before you begin the cleaning process, as cleaners aren’t able to penetrate through a buildup of old wax. Remember, you don’t know who owned this furniture before or how they cleaned it, so start from the base. There are a variety of wax cleaners you can purchase at home hardware stores, or you can use a standard paint thinner. However, if you decide to use a paint thinner in your home, remember to wear a set of protective gloves and a mask! Paint thinner omits a strong smell and is harmful to skin if exposed for too long, so taking safety precautions such as protective wear as well as opening any near windows to ensure proper ventilation are necessary steps. Pour a bit of the paint thinner into a glass or stainless steel bowl and use a superfine steel wool pad (the finest you can buy) to rub your piece of furniture in circular motions across the surface. Be careful not to press too hard! You’re only trying to get rid of that top layer, not the wood or stain itself. With slow, smooth, circular movements, you will loosen any layers of wax and it will begin to liquefy. When this happens you can gently remove it with a soft cloth. Continue this exercise until all the wax is gone. After you have the residue removed, fill a new bowl with warm water and a bit of dishwashing liquid soap. Using another soft, clean cloth, wipe away any residue that the cleaner has left on the furniture. Clean one area at a time and make sure not to let the water pool or let it soak into the wood. After your antique is thoroughly cleaned, use a filler or a touch-up pen to repair old nicks, scratches, and holes. Once you have finished and everything has dried, you can reapply a new wax to your furniture (either a spray or a manual application) to make it look shiny and new. Upon drying completely, the piece will look restored to its original condition while still having that antique charm!